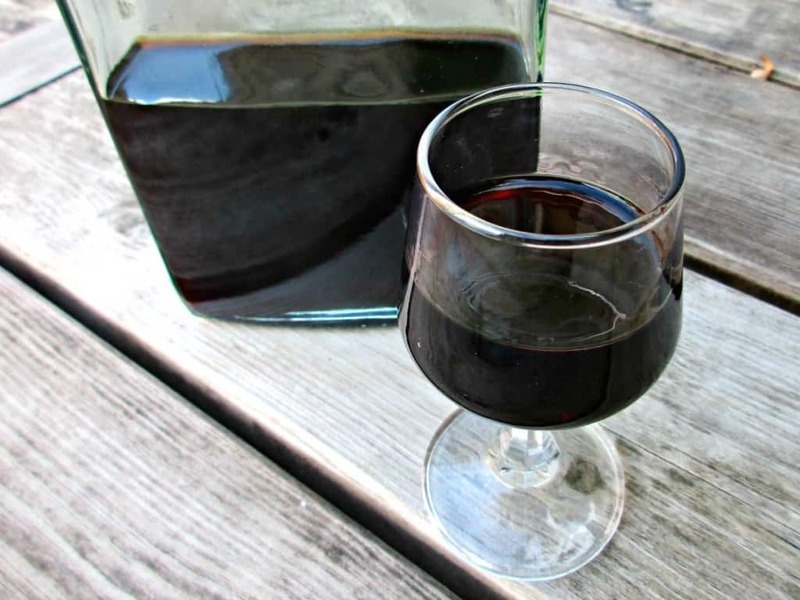 You Are Here Craft Invaders » CRAFTS » Food Crafts » How to Make Amazing Sloe Gin – Best Recipe Ever! Every year we forage for sloes to make sloe gin. Sloes are the fruit of the Blackthorn shrub (Prunus Spinosa). It is native to Europe, Western Asia and parts of North Africa, and has been introduced to other parts of the world. Blackthorn, a member of the plum family, has been used here in the UK as stock proof hedging for centuries. Consequently, in rural areas, it is a very common sight indeed. In our local hedges we find three species of wild plum; Sloe, Bullace and Damson. It can be difficult to distinguish them from each other but all of them are edible so we don’t worry too much if a few bullace find their way into our recipe. 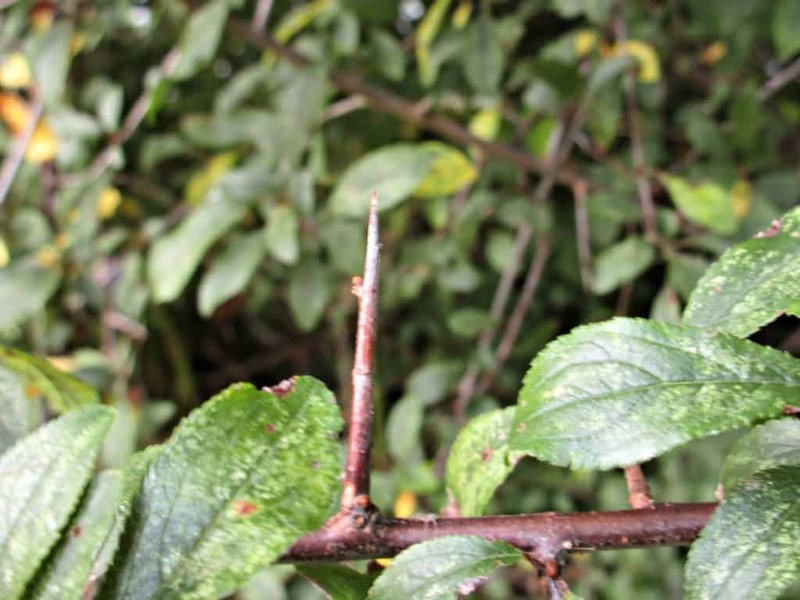 I find the easiest way to identify Blackthorn is by locating its vicious thorns. The fruit, which starts off green, ripens to a wonderful black with a blue/purple wild yeast bloom to them. You can read more about natural yeasts in How To Make Sourdough Starter from Wild Yeast. Raw, the fruit is super tart and astringent, but like many wild fruits they make a wonderful, jewel like jelly, and can be made into a delicious liqueur which here in the UK we call Sloe Gin. 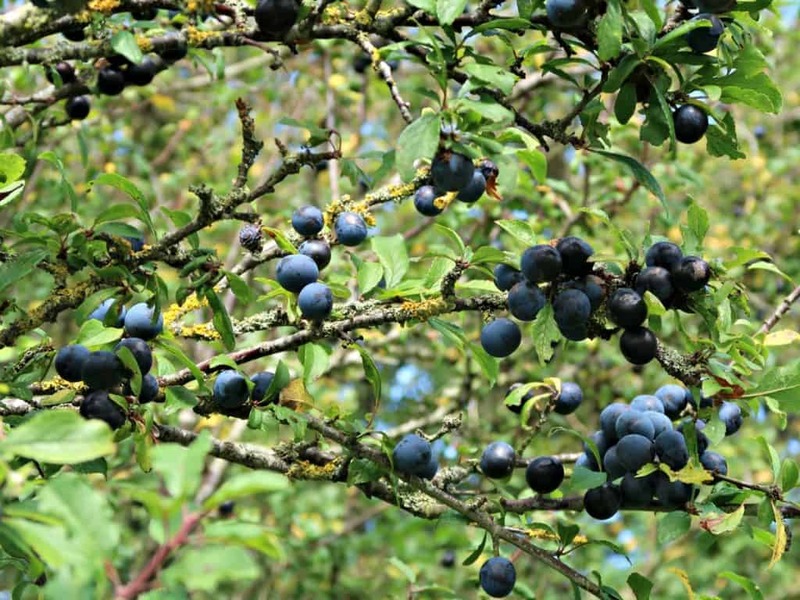 Traditionally Sloes are picked after the first frosts, as it is believed that this is when they are at their sweetest. Old recipes call for each fruit to be pricked with a thorn from the same bush it came from, or a silver pin to allow the alcohol to permeate the fruit and draw the flavour out. I have made Sloe Gin by this method once, and can assure you it’s a tedious way to spend an hour or two . Older recipes also call for the sugar to be added to the sloes at the start of the liqueur making process, again to encourage the flavours to be drawn out of the fruit, however I prefer to leave sweetening to the end of the process, and add it in the form of a sugar syrup when we are bottling it. To avoid having to prick the individual fruits, I favour the method of picking the fruit and freezing it first. There are a number of advantages to taking this approach. Firstly, it means you can pick your fruit in batches, as you come across it, and save it up in the freezer until you have enough to use. Secondly, the freezing process sweetens the fruit for you, so you don’t have to wait until the first frosts. And finally, freezing damages the cell walls of the fruit, allowing the juice to impart its flavour to your spirit easily, without any pricking or use of sugar. 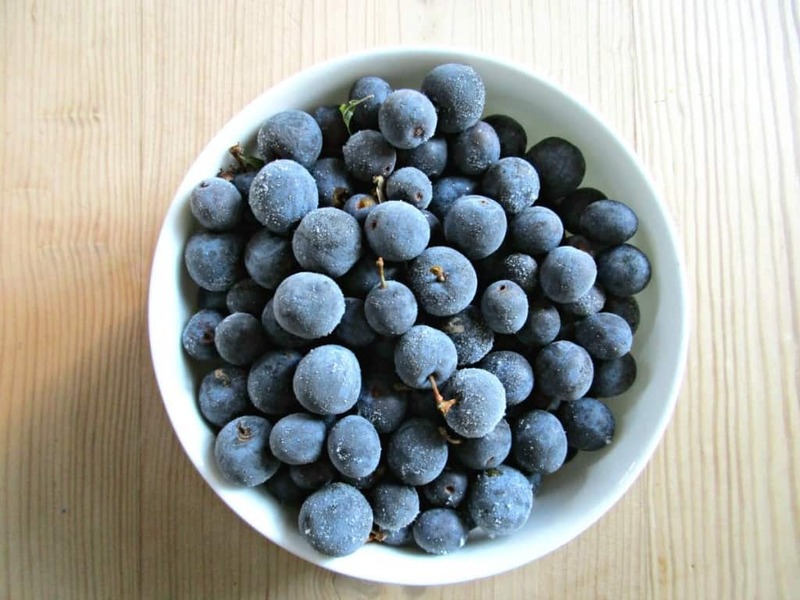 For more guidance on foraging and freezing, please check out our freezing foraged fruit post. 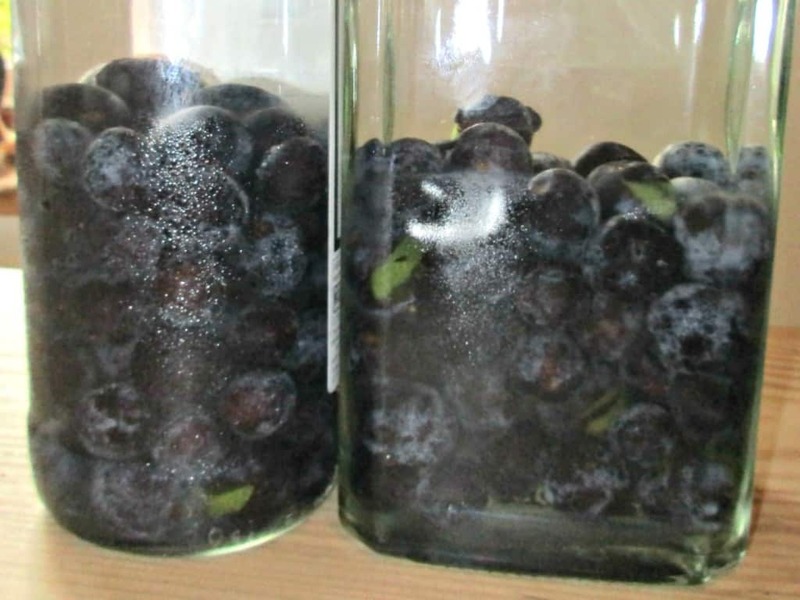 By freezing your sloes, the method for making Sloe Gin has now become super simple. Simple take your frozen fruit and roughly half fill a bottle or jar that has a well fitting lid. (Here we are using empty spirit bottles). Top up with gin, and leave to infuse in a cool, dark place for at least 3 months, giving it a shake when you remember. (I’ve left the fruit in for far longer with no ill effects). After it has infused, strain and sweeten to taste. You can see how the skins have split during the freezing and defrosting process in the picture above. Sloe Gin continues to mature over time, and each year’s batch will have a slightly different flavour and sweetness depending on the conditions of that year. This one from last year has now mellowed into a very smooth port like liqueur with a really dark colour, and delicious taste. Sloe Gin makes a perfect present for Christmas, and is an ideal addition to a Christmas Hamper. For more easy home-made spirit infusion ideas, please check out our Cranberry and Orange Liqueur, Christmas Spirit or, if you prefer something with a bit more of a kick, our Wild Horseradish and Ground Ivy Vodka. Thanks Sarah for the new spin for me on adding the sweetness after the process of storing the gin & sloes together. Went a bit crazy for me this year & have a batch of 7 1/2 kilos of sloes in the freezer, but today is the time to drag out the litre bottles of gin & let the mixing begin. We traditionally make something like this here in Navarra, Northern Spain. But it is made with our local, easily available sloes,along with a few coffee beans and a cinnamon pod in special dry anisette, for one to eight months. It is called Patxaran. I sweeten all my infusions once they are made now – makes for a fun tasting session! I’ve never made my own, but am partial to a bit of sloe gin. Your tips are fab, if I can find some sloes I will give it a go. Also liking the idea of your cranberry and orange liqueur, making me feel quite christmassy! Could I replace with blueberries? I’ve never tried making it before but must rectify that and have a go at it as would love to have my own stash! Sarah, I love reading your posts about making a liqueurs. It is so fascinating to me and you’ve made an art of it. I don’t think we have this fruit here, I am going to have to look, this sounds like a really fun project. Especially as the flavors change from year to year, it would be so fun to see what it’s like when you pop the top for the first taste! I also really love that you know exactly what’s in it, as I get older this is so much more important to me! Cheers!